If you are scheduled to appear in court in Waterford Michigan at the 51st District Court, make sure you bring the right lawyer with you. Attorney Daniel Hilf appears on a regular basis before both Judges of the 51st District Court and is respected by the same due to his legal acumen, litigation ability, and professionalism. Regardless of the charge you are facing in Waterford, attorney Daniel Hilf will provide the type of legal representation that you need. When the way you live your life is in doubt because of an arrest, it is critical to have an experienced lawyer when going against the Waterford Police Department, the Oakland County Sheriff's Department, the Michigan State Police, Waterford city attorneys, assistant Oakland County prosecutors, and the endless resources of law enforcement. Having an attorney who does not buckle under the pressure, who can think on his feet and use his many years of experience to your greatest benefit, with a solid reputation, is what you need from your defense lawyer. Regain control of your future and address your stressful court case by retaining attorney Hilf. When it comes to cases at the 51st District Court in Waterford there is no tolerance for the wrong legal advice, an unprepared lawyer, or for anything short of the best legal representation. Criminal defense attorney Daniel Hilf's obligation is to provide the best possible criminal defense and to aggressively fight for clients who have to go to Waterford District Court due to an allegedly bad time in their lives. Attorney Hilf's commitment is to present compelling defenses at trial, or to aggressively attempt to negotiate a great outcome through a plea bargain or sentence agreement when available, at the client's direction. Attorney Hilf will never railroad you, and will only act according to your best interests and in accordance with your wishes. False criminal charges are the toughest cases for lawyers to handle, because the stakes are very high. Understanding the cause of the false charge is very important in the defense of the charge, and may include (but is not limited to) any of the following: self interest (child custody issues, property division, ongoing divorce, etc. ); lies; deception; assumptions that are misguided or wrong; mistakes made by police officers and/or eyewitnesses; persons that are purposely targeted by police officers due to a prior criminal contacts (rounding up the "usual suspects" mentality); personal or racial bias; police officers jumping to false conclusions; violations of Constitutional rights; etc. Police officers always are attempting to classify the world. For criminal investigations, civilian persons [persons who are not police officers] relevant to the investigation are classified either suspects or witnesses. These classifications can change during the course of the investigation, with the witness becoming the suspect, and vice versa. Law enforcement officers are not neutral, and l commonly use tactics and tricks to elicit damaging statements from witnesses and suspects. Sometimes in this process false confessions are elicited, and sometimes innocent people are persecuted due to a mistake made during the investigation. Lawyer Daniel Hilf's commitment is dedicated to fight all injustice by conducting thorough case evaluations and preparation to provide a vigorous defense. Overcharging procedures also are a common source of injustice. When the prosecutor decides to pursue against a person a more serious charge, even though the circumstances indicate that the charge may be more serious than what is deserved, the result is overcharging. Sometimes overcharged cases are plead down to a less serious offense. In many instances, fighting for acquittal through a trial is the only option to consider. Litigation strategy differs depending upon the case, and needs to be discussed with a lawyer in a private setting such as the lawyer's office. 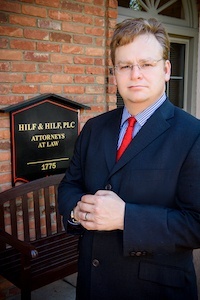 Informing clients as to their case status and providing discovery, defending client rights, compassionate legal assistance, uncovering the weaknesses in the government's case, strategic litigation, and fighting for the best result all play large roles in lawyer Daniel Hilf's approach to criminal cases. Hiring your lawyer is a choice - make sure you make a great choice. Before you pay money to a criminal defense attorney, make sure you know his or her background and abilities. Your research into defense lawyer Daniel Hilf will provide the following verifiable facts: he has won several awards for his legal advocacy work; he has 20 plus years of legal experience,; he has completed over 100 jury trials (many successfully); he is referred to many new clients by other lawyers and former clients; he has a professional office in Troy Michigan; he has appeared on behalf of clients on thousands of occasions throughout Michigan; and he prides himself in the number of extremely satisfied current and former clients he has. Searching for the Top Criminal Defense Lawyer in Waterford? Criminal allegations require the time and effort from an experienced lawyer helping you. Why take chances when it comes to the quality and ability of your attorney? Contact attorney Daniel Hilf today. Do you have to go to Court in Waterford due to a ticket or criminal allegation? It is time to remove stress and negativity from your life, and to start thinking positively about your chances in Court. You can retain Daniel Hilf as your lawyer today, because he offers payment plans in many instances, when needed. In fact there are a variety of payment choices available, including: credit card, debit card, wire transfer, money order, cash, cashier's check, personal check, to make it easier to secure great legal representation. Please contact Hilf & Hilf today and ask for attorney Daniel Hilf.